The IFMA World Workplace Conference, one of the leading conferences for discussion and trends for the work environment, took place this past October and several CannonDesign team members were able to attend/or present. Now, a month removed from IFMA World Workplace, several key trends from the conference remain of key focus for organizations and the industry. I’ve highlighted several below. Sensors, sensors and more sensors. With the extensive discussion around the Internet of Things recently, we’ve been hearing more and more about the development of sensor technology in the work environment. It is quickly becoming a critical tool to track space utilization. Sensor data can be collected over longer periods of time than traditional methods and the data can inform space allocation and sizing to create more efficient and effective work environments. Moving from cramming and jamming to voice and choice. Choice and flexibility in the workplace are still trending – especially as employee engagement declines and new generations entering the workforce rises. Why are many employers still creating environments for people with relentless rows of workstations? 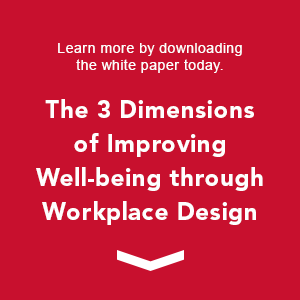 The workplace conversation has shifted from efficiency to engagement and effectiveness. Happy Worker – Productive Worker – Do we really need a metric to prove it? Yes! Especially if you’re building a case for change. Nothing speaks louder than data that measures things like the ROI of engagement, well-being, productivity and attraction/retention. Metrics are critical when meeting with the C-suite…and getting the CEO on board can be the difference in getting projects to move ahead. Over the next year, our Workplace Strategy team will be investigating the use of sensor technology in our processes and also methods for measuring the ROI of workplace change.